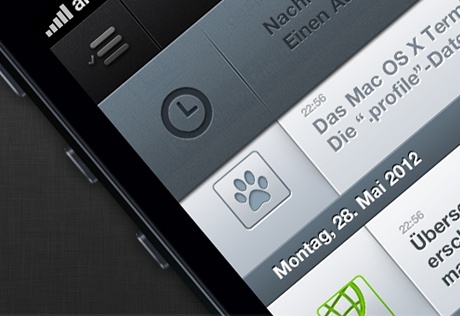 The ifun news app is a contract work for ifun.de and the iphone-ticker.de, Germany’s largest Apple lifestyle blog. The universal iPhone and iPad app uses push notifications to notify a user base of over 90,000 active users. MadeInGermany is a self-driving vehicle developed by AutoNOMOS Labs. It can drive autonomously in Berlin's inner city and highways and has been featured multiple times in national and international press and media. iDriver is the world-wide first iPhone controlled vehicle. By using GPS, acceleration sensors and the touch interface, the iOS app is able to control steering, acceleration, and brake of the car. It has been demonstrated to various press and TV teams all over the world. 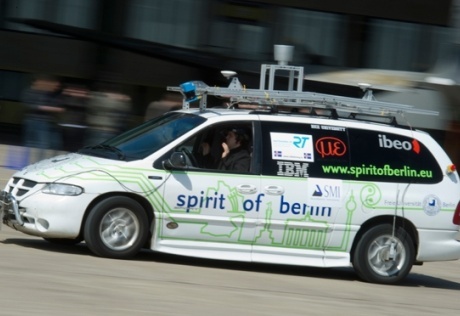 Spirit of Berlin is an autonomous vehicle by the Freie Universität Berlin and the entry to the 2007 DARPA Urban Grand Challenge. It sets up the foundation for research in unmanned driving in urban areas under real traffic conditions. 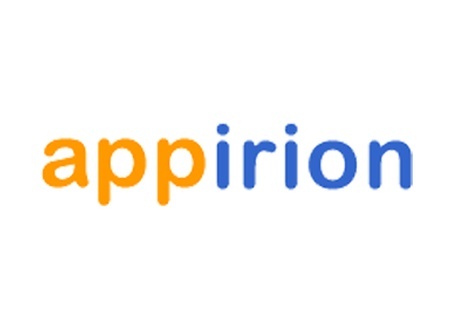 Appirion is a spin-off of the AI and multi-touch working group to develop iOS and Android apps for commercial, educational and research use. It gives students the opportunity to realize app ideas in an entrepreneurial surrounding. 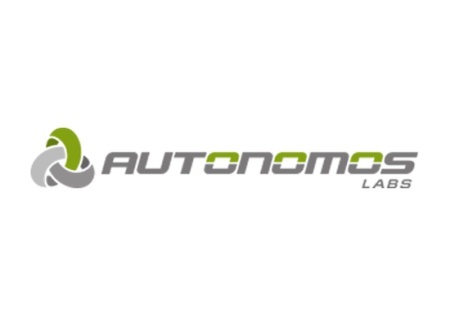 The AutoNOMOS project is funded by the German Ministry of Education and Research (BMBF) for autonomous or semi-autonomous vehicles. The team contributes in sensor data fusion, trajectory generation and HMI for an accident-free, efficient, and environmental-friendly future. During the summer tour of Dr. Annette Schavan, the Federal Minister of Education and Research became the first government official to have a autonomous ride in MadeInGermany. The event was covered by national and international press. MadeInGermany succesfully drove the city highway of Berlin from Kaiserdamm to the new Berlin Brandenburg Airport. Thus, it manages to transport passengers autonomously from the city center to the closed Tempelhof Airport and the active airports in Berlin. 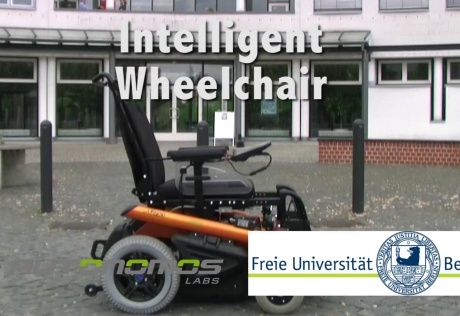 The Intelligent Wheelchair project was a prototypes of steering-devices for an electric wheelchair based on the technology developed by AutoNOMOS Labs. 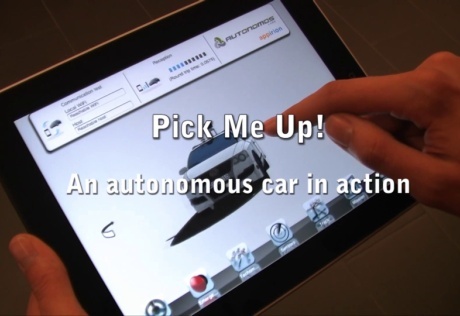 It features autonomus driving as well as semi-autonomous control with an iPhone app. iDriver 2.0 is an iPad adaptation of the iDriver iPhone app. It connects directly to MadeInGermany and can read out crucial sensor data readings. As with the iPhone version, it allows manual control and also can send autonomous missions to the vehicle. 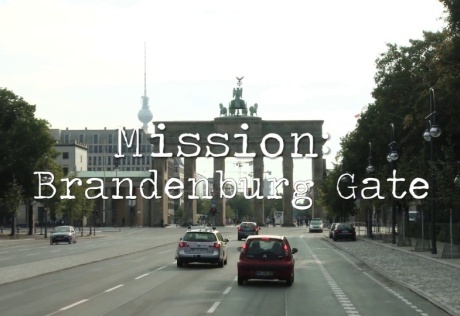 The Mission: Brandenburg Gate was a succesful attempt of MadeInGermany to drive autonomously in Berlin's inner city and real traffic from the Messe Berlin fairgrounds to Brandenburg Gate. The car merged into two big roundabouts twice and detected 46 traffic lights. The Michelin Challenge Bibendum is an annual sustainable mobility event for future transportation systems. MadeInGermany demonstrated autonomous driving with traffic light detection, lane changes, and high-speed racing maneuvers. 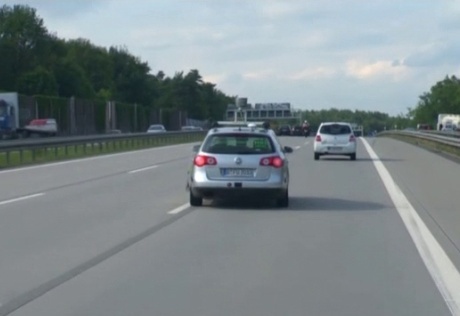 MadeInGermany showed high-speed autonomous highway driving including overtaking on the Autobahn in real traffic, which has been documented by Discovery Channel Canada for the 17th season premiere of Daily Planet entitled "Road Warriors". 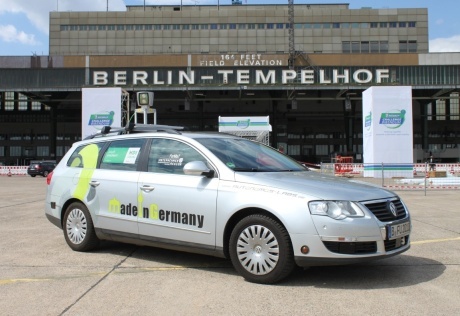 MadeInGermany demonstrated first autonomous drives in a highway scenario on the AVUS in Berlin, Germany. 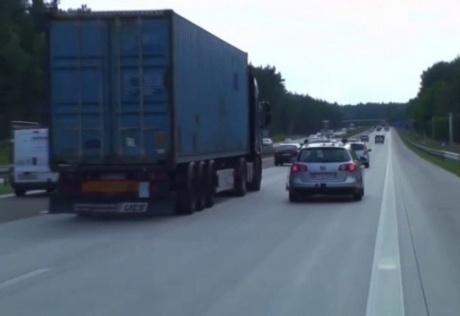 On the Autobahn, the car drove up to 120 km/h maintaining a safety distance to preceding vehicles, while executing lane changes and overtaking autonomously if needed. 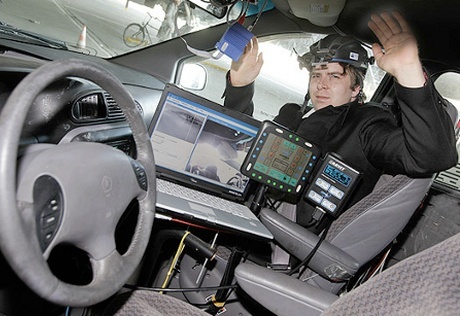 BrainDriver is a spinoff to EyeDriver and iDriver, which enables the driver to steer a car with brain waves. Neuro-signals are acquired using an Emotiv EEG neuroheadset and interpreted as patterns associated with steering and semi-autonomous actions. 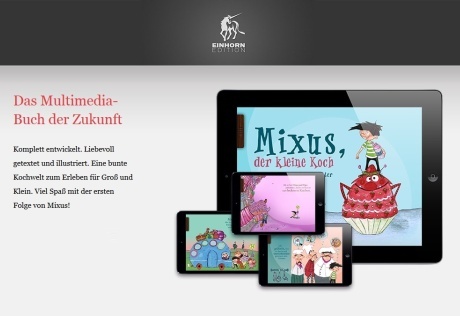 The Mixus App is a contract work for Einhorn Edition to create a interactive digital children's book on an iPad. 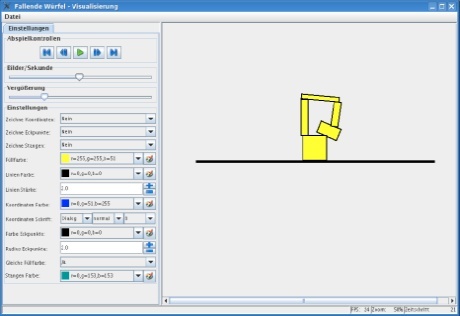 It features visual and audio animations as well as puzzles. It uses In-App purchase to download additional episodes of the Mixus series. The official Marathon App for the Berlin 2011 Marathon was developed by Appirion. It allows live tracking of runners and their current positions, which is broadcasted to all spectators. Furthermore, it contains general course information and emergency contacts. 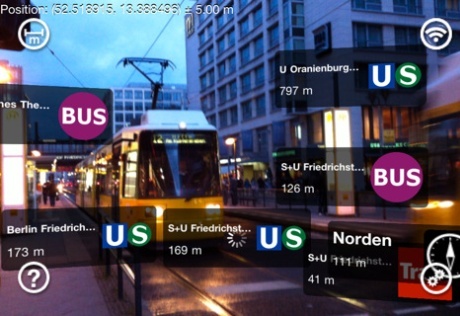 The GuideMe App provides an augmented reality search for nearest bus and train stations in Berlin. It uses the current public transportation timetable to guide users to the desired target location. Estimated time of arrival and distance are constantly updated. In a practical programming course for undergraduates, the students were given the task to develop a multimedia meta search engine in 3 weeks under my supervision. 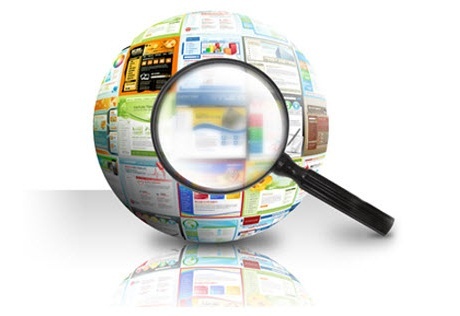 The project includes text and image search, as well as specialized lookups for products, videos, apps and software. 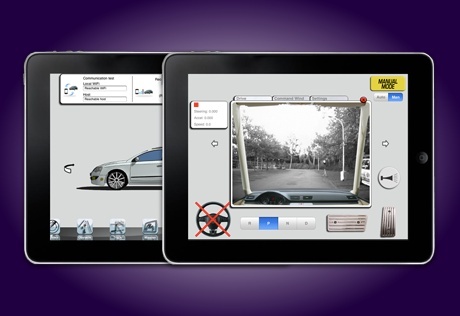 EyeDriver is a direct spinoff to iDriver, which enables the driver to steer a car using eye movement only. 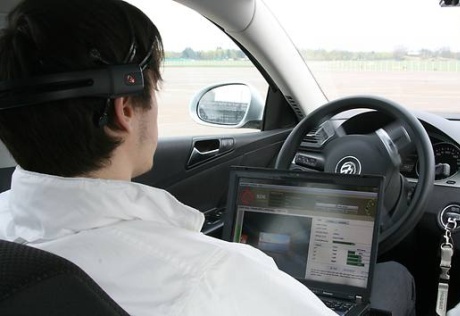 An Eye-Tracking-Device by SMI allows a precise gaze-direction of the driver's eye to adjust the steering of an autonomous vehicle. The Autonomous Taxi showcase is a combined effort with iDriver 2.0, an iPad version of iDriver, to demonstrate the potential use of autonomous vehicles in a future mobility scenario. The self-driving taxi can pick passengers up and drive them wherever they want to go in a car-sharing concept. 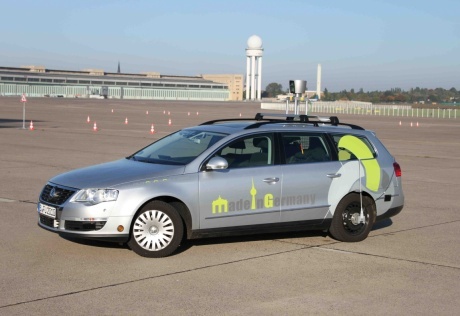 The first autonomous tests of MadeInGermany (Autonomos Labs) have been coducted on the Tempelhof Airport in Berlin. 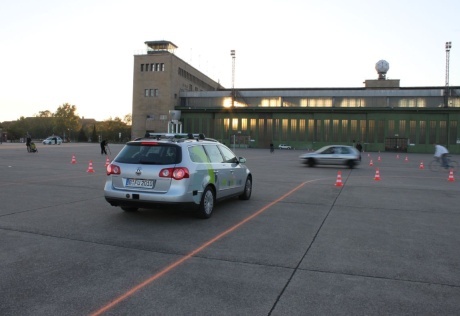 It featured intersection handling, traffic light detection, following and overtaking maneuvers, supervised by the German Ministry of Education and Research (BMBF). 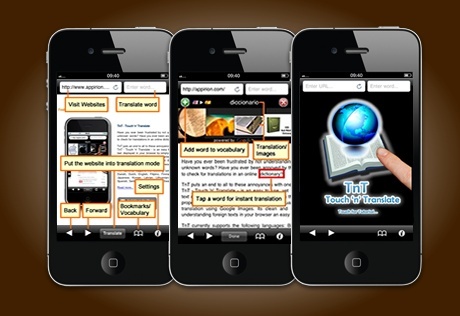 Touch'n'Translate is a translation service which is built into the browser. Translation and illustrations are shown on top of the webpage for each selected word. Additional dictionaries can be loaded into the app. 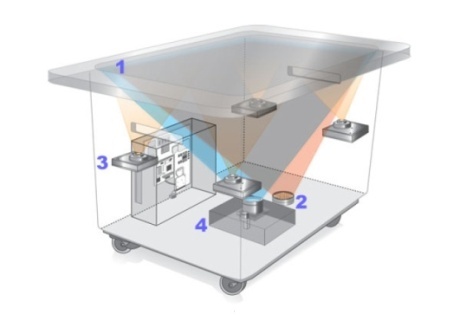 The multi-touch research group develops solutions for multi-touch usage and software applications. 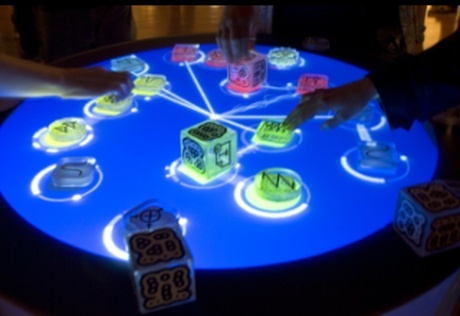 It ranges from small smartphone apps all the way to huge multi-touch table setups. New pattern recognition algorithms are used to detect and track finger blobs for gesture recognition. 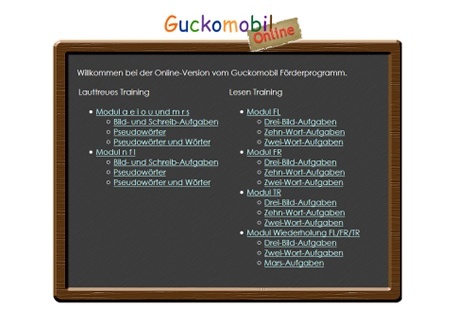 In collaboration with the Experimental and Neurocognitive Psychology department, Guckomobil is a program supporting children with difficulties to learn the German language. It allows early diagnosis of grapho-legasthenia for teachers and scientists over a desktop program or online session. JavaSettlers is a project combining the concepts of jGameAI for the board game "Settlers of Catan" together with the intuitive use as a multi-touch table system. This system allows a intuitive board-game approach for non-experienced players to play against adaptive AI opponents. jGameAI is a generic AI-framework to develop games with sophisticated artificial intelligent used by computer agents. 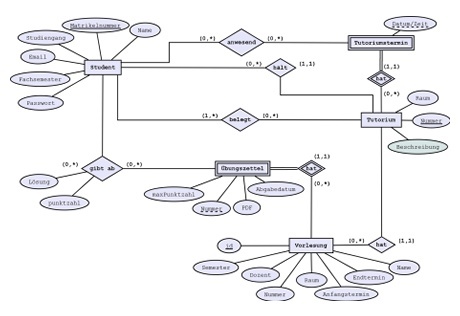 A generalized search method optimizes the strategy and actions of computer player with machine-learning algorithms. The framwork can be easily integrated in various popular games such as Poker or board games. Asteroids-AI is a artificial intelligence developed with jGameAI for the popular realtime game Asteroids. The main research focused on the prediction of the best action sequence in a dynamically changing environment using temporal difference methods. Asteroids-AI has surpassingly performed in the c't creativ' 08 contest. ParaDental is a joint project by Hasso-Plattner Institute and Stanford University. The goal is to develop a visual assistance system for dental care. Data is retrieved from a electric toothbrush and visualized with Flash and ActionScript. 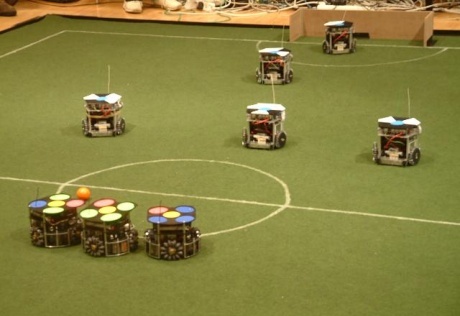 FU-Fighters are the robotic soccer team of the Freie Universität Berlin in the Small- and Middle-Size League. Our team finished 7 times in the Top Three of the World Championships, including two victories. 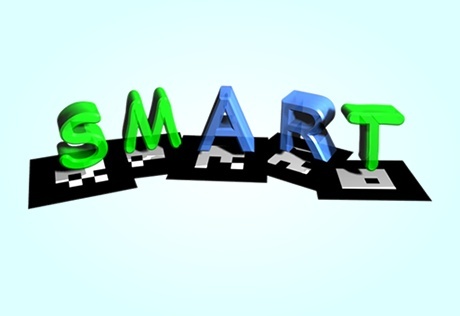 We have also won the European Championship and the German Open 4 times..
SMART is a maintenance tool for the IBM System z. It uses augmented reality to navigate users in complex system maintenance procedures such as repair procedures. The project has been implemented during the Exteme Blue program in 2007. 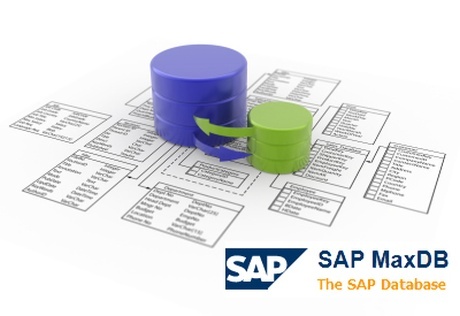 A set of test tools were developed for the SAP MaxDB system targeting large SAP environments and the SAP Business Suite. The test suite runs a series of scheduled regression tests and logs the results remotely. 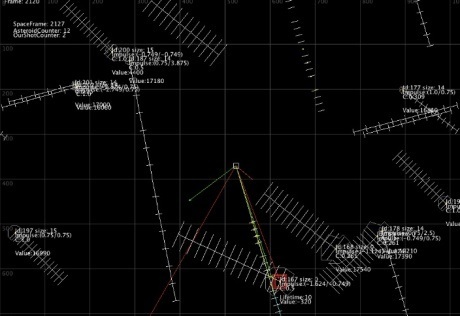 Critical errors and crashes are automatically processed in a statistical view for reporting and analysis. 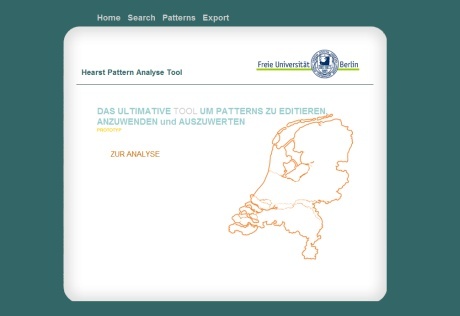 Hearst Evaluator is a novel online semantic web search engine based on hearst patterns. It uses natural language processing to enhance search results and evaluates statistical significance for the given search terms. The project has been delivered to Neofonie GmbH, Germany. Falling Cubes is full-scale realistic simulation of a collapsing stack of cubes. All calculations are based on a theoretical model which requires quadratic programming. The Computational Geometry Algorithms Library CGAL has been used to solve it efficiently. TutHelp is a web project designed to help staff members to supervise exercises. It can manage multiple courses, seminars and intelligently associate exercises with according staff members for grading and evaluation. 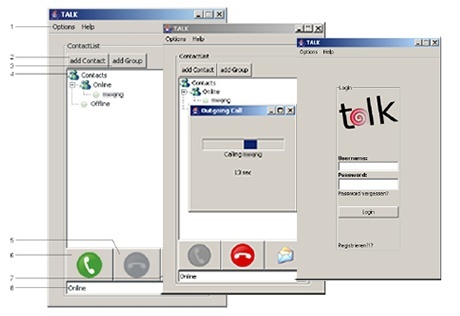 TALK is a open source VoIP-Client and Instant Messenger developed in Java using JMF. It features a security layer with a session based method protection against SQL-injections. 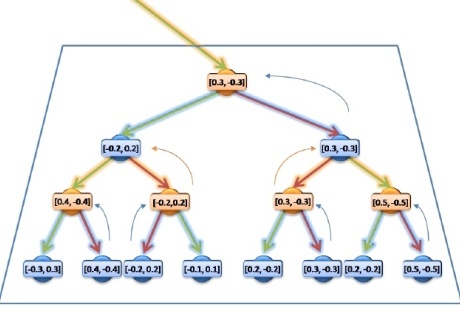 The user connects over a P2P protocol and a cryptographic layer with other users.